This is a smoky, full-bodied miso soup, with a raspy voice and a penchant for half truths and white lies. It's the kind of thing you plunge into, like a lake at midnight after the water has turned ink black and you can no longer see the bottom. It is that enveloping. If you didn't know better, you'd guess that it came to be only after long hours of building flavor through endless boiling and straining. You'd guess that this soup really made you work for that first soul encircling sip. And if you serve this to anyone else, you may as well let them think it. The secret to this soup is in the stock. Where usually you might find a recipe calling for dashi, a kind of Japanese soup stock, here you flavor the water with bonito flakes, which are flakes of dried, smoked bonito fish. After the bonito gives up its salty/smokey flavor to the water, you strain it out for a near instant and deeply flavored broth. And after all, it is the broth that keeps us plunging back in. This particular recipe doesn't contain either the typical green onions or tofu, but feel free to add either or both. Instead, I've given it a shot of arugula, whose assertive personality mellows alongside the wakame. You might also consider watercress. I found both the bonito flakes and the wakame at Whole Foods, so they're not so obscure to keep you from creating your own personal pool of miso. Heat the water in a pot until just ready to boil, then add the bonito flakes. Turn the temperature down a bit and simmer for two minutes. 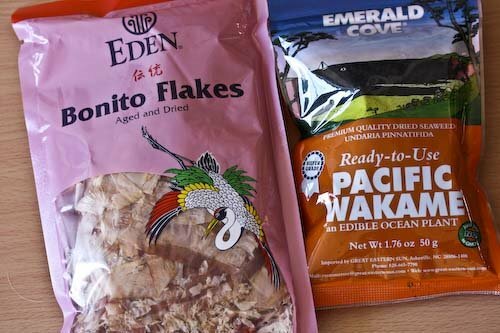 Remove from the heat and let stand 5 minutes, then strain the bonito flakes out and discard. Add the mushrooms and the wakame and return to heat. Simmer the soup over low for 20 minutes. Spoon out the mushrooms and cut into thin strips, discarding the stems. Return the mushrooms to the soup. In a small bowl, whisk together the miso paste and a bit of the broth from the post, then pour back into the soup. Continue to let the soup simmer. Just before serving, add the arugula and heat just so it wilts. Serve and dive in. Looks gorgeous and delicious! I love the pictures! How interesting, we just had miso soup for dinner! This does look soul satisfying. And how pretty with the persimmon flowers. That's it?? Not even a lot of ingredients for such a fancy-looking soup! I'm going to have to get courageous with the packaged Asian fish products...they are always so daunting to me. Thanks for the idea! 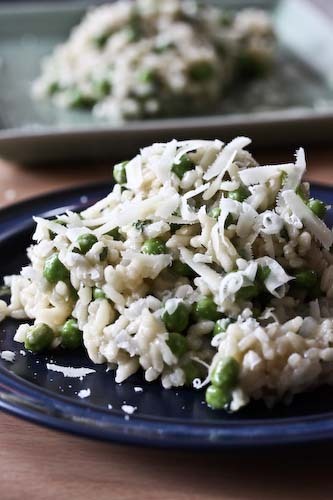 The recipe looks lovely, but your description and writing about it is out of this world. Very much enjoyed reading this. ps the persimmon flowers are a really nice touch! This looks wonderful. I love Miso soup. I always have it when we go to a japanese restaurant in NYC. I have never tried making it on my own. You make it sound so simple. Very inspiring! I bet it was delicious!!! Awesome photo also. wonderful read. my favourite sentence was ' It's the kind of thing you plunge into, like a lake at midnight after the water has turned ink black and you can no longer see the bottom.' Really made me smile. I ve never tried miso soup! looks delicious! I like your ad, "find a foodie, add a friend" link. Your food art is great. Do you deliver back here on the west coast? Your miso soup looks delicious. I love miso soup but have never made it from scratch. I have been afraid. But you make it so accessible that I had to save off the recipe. 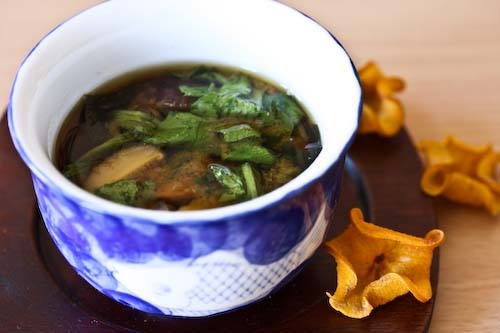 I love miso soup, and this sounds wonderful! yes, please do soups. I've started ordering just soup at restaurants for lunch and it really is enough as long as I have had breakfast. 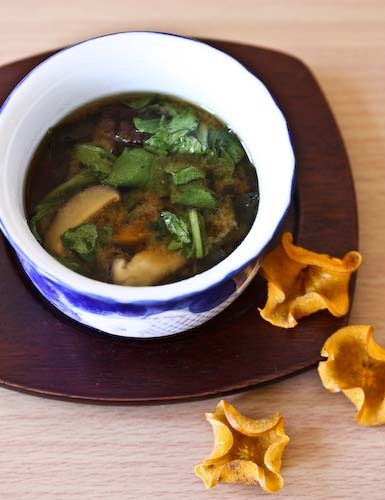 Love your miso soup! I love miso soup with seaweed! Your pictures are beautiful. Can I leave out the bonito? Any alternatives? Love the persimmon flowers. I can never get enough of miso soup! Your miso sounds and looks delicious! I just love it, it's so comforting! Olga, I like that idea. There's also No Croutons Required, which is a monthly soup/salad event. Veggie Belly, you can leave out the bonito flakes and perhaps try seasoning the broth with sesame oil and tamari. Try adding green onions, too, for some extra flavor.